Romance Readers, Enter to Win One of Seven Great Prizes in the Love to Last Romance Giveaway! Do you love reading romance? Do you love winning cool stuff? 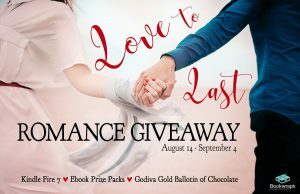 Enter to win Godiva chocolate, a Kindle Fire, ebook prize packs and more in the Love to Last Romance Giveaway! As a romance reader and author, I love being a part of great romance ebook giveaways. This month, I’m one of the sponsoring authors for the Love to Last Romance Giveaway. A love that lasts, that’s the “prize” written into the ending of the romances we love to read. And Love to Last‘s 35 sponsoring authors have some fabulous prizes for romance fanslike you. Will you take home a Kindle, ebook prize pack, or Amazon gift card? Enter now to find out.